VeeamON: the time and place where Veeam Software’s partners, customers, and prospects can learn everything they need to know from industry leaders who are paving the way to the always-on business. The conference consists of three days full of amazing general sessions, certification opportunities, hands-on labs, demos, an expo lounge and networking opportunities. Veeam Software showcased new innovations across Veeam Availability Suite and Veeam Availability Platform, to revolutionize the way enterprises deliver ‘Always-On’ Cloud Availability and how they operate in Multi-Cloud environments. MIG collaborated with Veeam throughout the entire pre-to-post process, working closely with their show event team to consistently offer fresh creative and technical solutions. The scenic configuration was comprised of a full 160’ x 20’ screen surface, which was revealed slowly and dramatically over the course of two days by an animated opening drape effect. This seamless surface was created by blending 6 Christie HD-14k Lumen projectors, with 6 additional online backups suspended over the audience; creating the most high-tech content delivery platform VeeamON has ever seen. Used kinetic animated lighting over the audience seating area to create a focal point that drove branding and supported content. We also featured animated partner logos for when partners such as Cisco and Microsoft took the stage. Integrated 4 demo stations that supported Veeam’s live demos from the stage and identified who was live on screen. Designed all content, from presentations to videos, to stunning animations and theme panels, all brought to life on the 3,200 square-foot screen. Built a custom VR journey using 4 Oculus VR headsets and 4 Talon Simulator VR Chairs, each showing how data is restored and delivered while on its voyage around the Internet world. We also provided high-quality cardboard VR glasses as a takeaway and posted the 3D VR journey online, so Veeam could keep the buzz going post-conference. 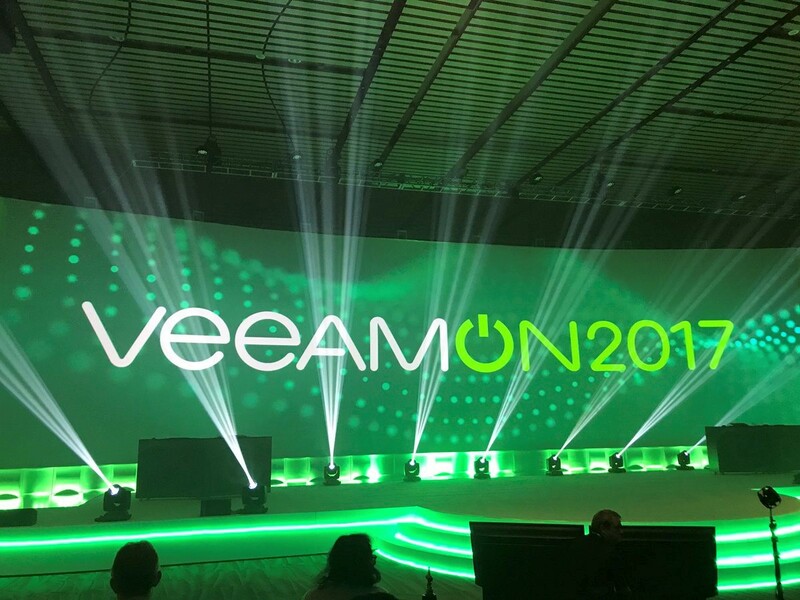 Featured a large screen in the common area to display partner videos/live broadcast streaming and social media activity: #VeeamON2017, which included a contest that awarded social media posts. MIG also featured a branded wall projection (in the common areas) that shared custom, thought-provoking content. Provided complete production, creative and technical support – as well as all of the complex rigging and lighting in the expo space.